The Peugeot Type 177 was produced between 1924 and 1929. It was the company’s mid-range offering and the 177M went on sale in 1927 featuring a transparent roof. But this car carries a coachbuilt body by Weymann and the exterior is wrapped in waterproof fabric, a Weymann signature touch. The engine is a straight-four making 28 horsepower. This car underwent a 10 year restoration that began in 1994. Finished in Bordeaux red, the black fabric appears to be a landaulette, but is indeed a fixed-roof sedan. Only 130 Weymann-bodied Type 177Ms were known to have been built and only three are known to still exist. This one should bring between $20,000-$23,000. Click here for more info and here for more from this sale. 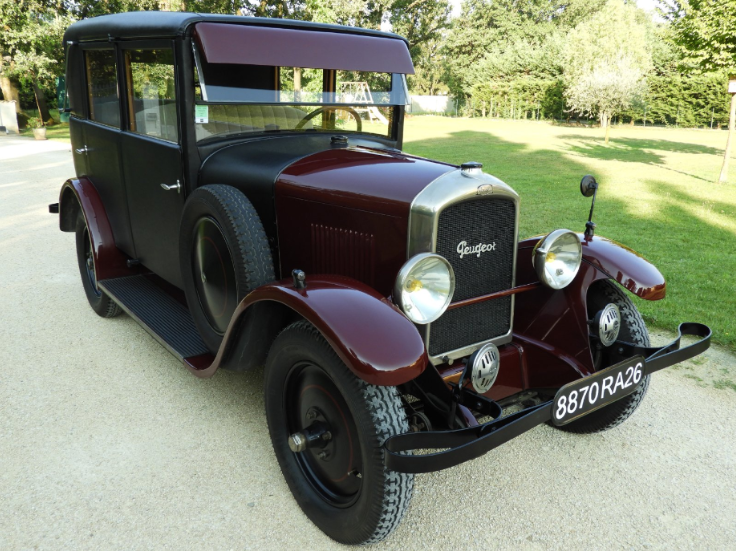 This entry was posted in Uncategorized and tagged 177m, 1927, auctions, cars, classic cars, leclere mdv, peugeot, sedan, weymann by classiccarweekly. Bookmark the permalink.